There has been news in last few months that the entrance examinations like JEE and NEET will be conducted twice a year from 2019, in online mode, by a new examination body i.e. 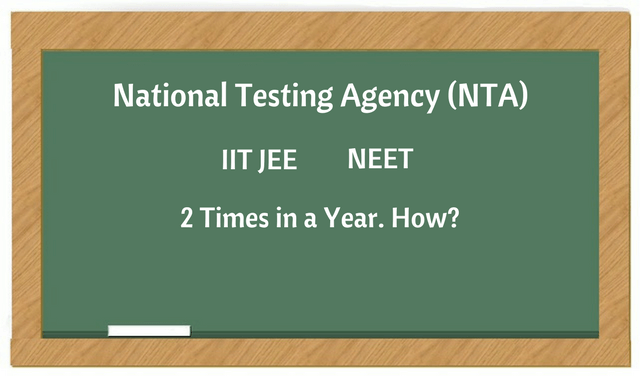 NTA (National Testing Agency). Is it really happening? Note : As per an RTI reply in April this year, HRD ministry said that NTA is “likely” or “expected” to conduct entrance examinations that has been conducted by CBSE so far, from 2019. UPDATE on July 7, 2018 : Now, it’s official that JEE Main will be conducted twice from 2019. Both the exams will be conducted in complete online mode. JEE Main will be conducted in January and April. UPDATE on August 21, 2018 : HRD ministry has reverted the decision of conducting NEET 2019 twice a year in computer-based mode. NEET 2019 will be a single exam in pen and paper mode, just like previous years. Through this post we are trying to answer queries of many JEE aspirants who are getting anxious about the news of changes in JEE Main pattern. From which year NTA will start conducting JEE Main, twice a year? Currently it’s in planning phase, MHRD along with newly formed NTA are working on how it can be implemented. There is no year or academic session they informed, when this new examination system would start. UPDATE on July 7, 2018 : NTA will start conducting JEE Main, twice a year, from 2019. JEE Advanced will not come under NTA. How JEE Main would be conducted two times in a year? The conducting of the examination twice a year is not something new. SAT, on a global level, is conducted multiple times during the year. For JEE Main, the best of two approach will be applied, where you attempt the exam twice and your best score among the two will be considered for the rankings. According to sources, the government wants to give candidates more opportunities in a year. It would look like : If an aspirant able to clear the exam on 1st attempt, well done! Relax, enjoy, and wait for admission. If not (or want to improve score), he/she can go for the 2nd attempt. UPDATE on July 7, 2018 : It’s official now. JEE Main is going SAT way, twice a year, from 2019. Students will have the choice to attempt both or one, the best score will be taken into account while giving admission. Number of seats can remain unaffected. The new examination system would not interfere the admission/counselling schedule. Overall it can be a big change in how JEE Main aspirants prepare for the exam. Most would try to clear the exam in first attempt, means early syllabus completion. If they miss out, then they need to improve, study and practice hard for the next attempt.